How does Pinterest work? If you are seeking an answer to this question then you are at the right place. We will discuss Pinterest in detail including Pinterest benefits for a blogger. Pinterest is a social media website like Twitter, Google Plus, and LinkedIn. It uses mostly images, videos, and GIFs to find information on the web. Therefore, you will find lots of images when you visit this site. In other words, you can call it an image-based social media platform. This website was founded by Silbermann in March 2010 and has crossed 200 million active users in the third quarter of 2017. Surprisingly, women are more active on this site and contribute more than 70% to its user base. Pinterest is getting popular each day, and people are using it to promote their products and websites. Surprisingly, women seem more interested and form more than 70% of its user base. Before proceeding further, let me make you clear that I am not an expert on Pinterest. But, I am sharing with you whatever knowledge I have gained by reading and implementing the learned tips about this social media platform. After log into the Pinterest account, click on your profile name, e.g. 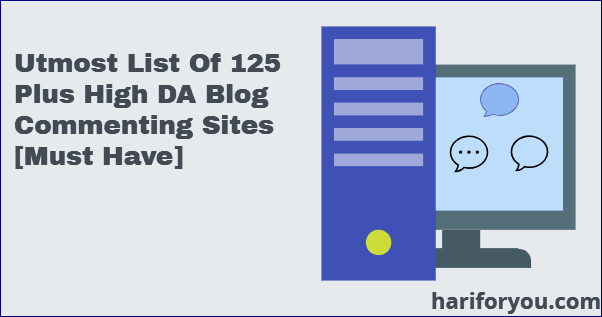 ‘Hari For You – Blog Journey’ in my case at https://in.Pinterest.com/hariforyou/. Click ‘Pins’ button that is next to ‘Boards’, a ‘Create Pin’ square with a + sign in the centre appears to the left of the screen. Click on this square, the ‘Create Pin’ window will pop up with two option – a) Upload Pin, b) Save from site. Use any one of the options and proceed. b) Pinterest Board – It is a place for organizing your pins around a particular interest or idea. If you have a blog, then you can think of a board as category and Pin as a blog post. In the same way, you can have many boards as you have categories. I have few boards on Pinterest and some of the names are – Blogging Tips and Tricks, SEO Tips, Make money online, Technology, WordPress Themes and Plugins, and Social Media Tips. c) Board Section – A section is a sub-board inside a board that allows you to organise Pins of your interest and ideas in an easy to find way. If you consider a board as a category, then a section is a sub-category of your product or idea. Suppose, you have few numbers of Pins on a board then it is not difficult to find any Pin of your interest. But, if the Pins are large in numbers, then finding a particular Pin is a difficult job. So, to make the search process easier the concept of a section has been implemented on the Pinterest. d) Repin – A Repin is an act of adding a Pin from somebody else’s profile to your board. When you browse Pinterest and come across any interesting Pin which you may like to share with your followers, then you can add that Pin to your board. Remember, when you Repin, the source Pin gets a credit. A Pin can be repinned any number of times, it will still carry its source Pin link. e) Rich Pin – These Pins have extra information in the form of metadata of the webpage to which they are tied. This metadata is independent of the Pin description. For the sake of an example, consider the pin “Blog Submission Sites” on my Pinterest account. You can clearly see the extra bit of information than a standard Pin appearing below the title. After defining the common terms above, let us understand how does Pinterest work. As Pinterest is a social network, you may use it to promote a product, service or content. For example, I am a blogger and use the Pinterest to promote my content over this network. Before going ahead to understand how does Pinterest work, let us briefly discuss the benefits of this social media platform. Sharing your blog posts on Pinterest can bring massive traffic to your site. If you share your business on this platform, it can bring rapid growth. A blogger can get fresh ideas for his blog posts topics. If your Pins are shared by others, it can give you a good number of backlinks. People are getting business from this platform and earning money. Each Pin can drive many page views and page visits. The possibility of a Pin going viral is many times a tweet. The life of a Pin is much higher than a tweet or a Facebook post. Normally, it is one week for a Pin, 25 minutes for a tweet, and 90 minutes for the Facebook post. Now, let us focus on how to use Pinterest to get web traffic to your blog. In this section, we will discuss the following topics to know how to use Pinterest for the benefit of our blog or business. Most of the users use mobile phones to view the Pinterest feed. Therefore, it makes sense to use Pins that are tall in size. So, what is the right size of a Pin? Some popular aspect ratios for a Pin are 2:3 and 4:5. For instance, if you have an image with a width of 400px, the height should be 600px. Remember taller images are preferred on Pinterest as they occupy more space on the feed and it is difficult to pass them. The images you choose for Pins should be attractive. Beautiful images generate interest in visitors and often lead them to click the Pins. A Pin with many vibrant colours attract more pinners and eventually leads to many repins. Images without human faces get more repins as people enjoy glancing at images without faces. Plain and simple background images are less viral on Pinterest. You should add colours to the background also. Red colour or shades of this colour make images beautiful that people would love to see. You can use pink colour also. Don’t use dark colours, rather choose light ones for Pin images. This action will get you more repins. 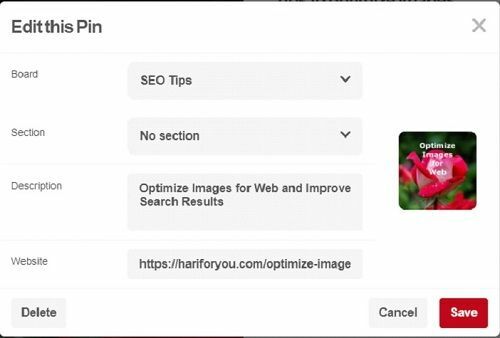 If you want to make your Pins rank higher in the Pinterest search, use keywords in the Pin image name and the Pin description. This SEO activity along with some others will improve the probability of your Pins to be found on the first page of search results. For example, if a keyword of your Pin is how does Pinterest work then, name your image file as how-does-Pinterest-work-pin.jpg. Similarly, in the Pin description, you can enter the title of your article which usually has the keywords. So, in this case, description will read How does Pinterest work — Know its benefits for a blogger. If a visitor likes a Pin and wants to navigate to your web page, he can do so in two ways. In the first method, he can click the Pin to let it grow and again click it to reach your web page. While in the second option, he can click the domain name that appears when he hovers over a Pin and still reach the same web page. Remember, we should make it easy for a visitor to navigate to our website if we want more web traffic. The easier anybody finds it to reach your webpage, the more traffic you can expect. Do you know how frequently you should pin? There is no straightforward answer to this question. Someone will say 5 times and other may say 100 times. 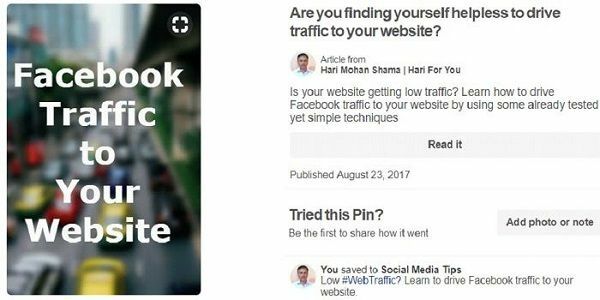 You can start pinning 5 times a day while keeping a track how much traffic it brings to your site. You may go up to 100 pins a day, but definitely not more than that. To do pinning in quick time you can schedule this activity using any social media tools like ‘Buffer’ or ‘Tailwind’. It will save you a lot of time. Moreover, you can use these tools for free. Frequent pinning will expose your Pins to the people from different geography and drive traffic to your website. You cannot depend on a particular country for the traffic. If you are new to Pinterest, you should pin other people’s popular Pins on your boards. It will make people click on your Pins also. 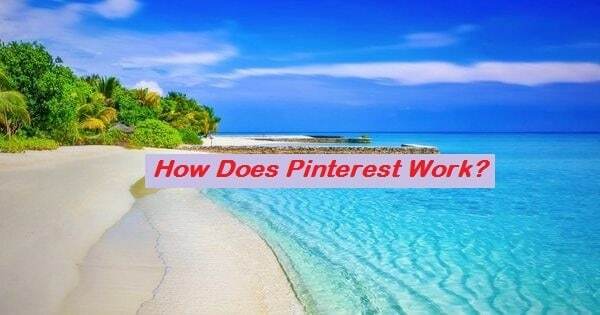 It is an important tip to understand how does Pinterest work. Practising this tip will also improve your understanding of how to use Pinterest. What is the right time to Pin? To get the answer to this question we need to know the time when people access their Pinterest feed. As per the studies, 9 am, 1 pm and 3 pm are the times you should try for pinning. If you follow these timings your Pins stand a good chance of exposure to more visitors. 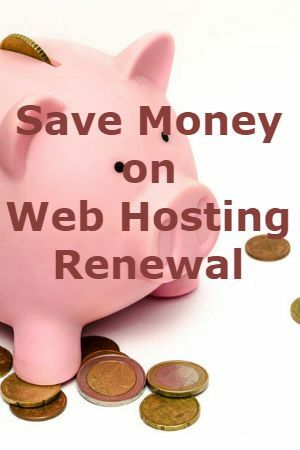 Ultimately, it will convert to increased traffic to your website. Still, you can try other timings to know which ones suit you the most. It is also worth noting that your Pins are accessible to people living anywhere in the world. Therefore, it is advisable to pin at an interval of four hours, and at least three times a day. This strategy will bring more traffic to your site. A normal Pin shows a little information — some text on the Pin image and in the Pin description. It is sometimes not sufficient for a visitor to get a clear idea you are promoting. As a result, many visitors do not click the Pins. To get over the above issue, Rich Pins have come into existence. They carry more information about the idea you intend to promote. For example, if you have an article Rich Pin; it will have the title (a title that you write for sharing an article on social media), meta description, date of article publishing, and a call to action button. All this information helps a visitor to get a clear idea of what you are promoting and if he likes, he clicks the ‘Read it’ (call to action) button to access the article on your website. As a result, you will get a boost to your web traffic. For example, look at the above Rich Pin displaying extra information (meta description). Rich Pins are of four types: article, product, recipe, and app. To know the procedure of creating a Rich Pin, please visit the official Pinterest site at https://help.Pinterest.com/en/articles/enable-rich-pins-your-site. Note: Above tip of using Rich Pins is very important and you just cannot miss it. Understanding and implementing Rich Pin concept improves your understanding of how does Pinterest work. It will definitely add to your traffic. When you create your account on Pinterest you can utilize this opportunity to improve your SEO. First, you should add your website to the profile and then verify it. A verified site sends the positive signal to the visitors who are looking at it. It tells them that you actually own the site. The next thing to do – add your domain name to the title. To do so, simply add your display name in the first name column and domain name in the last name column while editing your settings. The above-mentioned two steps will make it easy for your audience to search and find your account Boards and Pins easily. Moreover, if your site tagline is also included in the title of your profile, it will further help in search results. By this time you will feel you have gained some understanding of how does Pinterest work. One more place to improve SEO of your Pinterest account is the ‘About You’ section in your profile setting. Grab this opportunity and insert important keywords of your blog or business in the description of ‘About You’ section. Make this section impressive yet short. It will make your Pinterest page more searchable and likeable by the people. You should adhere to the social media rule — follow others to get followers. Therefore, find your niche related boards and people and follow them. This way many people will start following you which means whenever you pin a new Pin they will be alerted and may click your Pin. One more important thing that you can do is – leave genuine appreciation comments on others’ Pins and visit their sites. By the social media rule, you can expect reciprocation. In other words, you will receive more traffic to your site. Some of the visitors may like an article on your website. To enable them to share the article you must have a popular social media plugin installed. You may choose any of these plugins – Social Warfare, Monarch, Sumo Share, Addtoany, etc. Ensure social media plugin is configured for all the popular social media sites like Pinterest, Twitter, Facebook, LinkedIn, etc. Moreover, at the end of an article, ask your audience to share it on their social network if they like it. To pin an image of an article quickly, you should install Pinterest Browser button. It will also help you to pin any image on the internet to your Pinterest page. Currently, Pinterest browser button is available for Google Chrome, Internet Explorer, Microsoft Edge, Mozilla Firefox, and Safari. Remember, Pinterest is the fastest growing social media network, and if you use it smartly, traffic to your website can grow significantly. I am convinced if you use all the tips mentioned in this article, you will reap the benefits. Moreover, it will be a good demonstration of your knowledge of how does Pinterest work to your advantage. If you like this article on ‘how does Pinterest work’, then do not forget to share it on your social networks. An awesome guide on how to utilize Pinterest effectively to drive traffic. Well documented and well explained. Thanks for this helpful article! I keep hearing that Pinterest can increase blog views, but I wasn’t sure how to use it. I appreciate the tips! Thank you for this great article! I was actually wondering how I would use Pinterest for promotion and this was really helpful! Keep up the good posts! thank you for article of Pinterest use .it is very effective for website traffic. Pinterest is really helping me to grow my business. we can get good traffic through pinterest and it is great site. I have a Pinterest account, but i have never used pinterest. Thanks for sharing this tips with us, the tips are just awesome. Now i will go through it. great article about how to get traffic from pinterest but what to do if my blog havnt any picture or images. You can create an image with your blog post title and share on Pinterest. Pinterest is a very good platform to share your articles in great images form.